Dentures, a removable prosthetic appliance, are a common solution when you have lost your teeth. They restore your ability to eat your favorite foods and to be understood when you speak. However, dentures are supported by your gums, and can often lead to issues if proper care is not taken. Here are a few tips on how to keep your gums happy and healthy. Dentures are removable for a reason. They are not meant to be worn around the clock. Dentures are supported by your gums, as well as the bony ridge underneath them, and this puts pressure on your gums. Constant pressure can quickly lead to irritation. For this reason, it is important that you give your gums a rest by leaving them out while you sleep, which allows oxygen and nutrients to travel to the tissues. A healthy diet full of nutritious foods keeps your entire body healthy, including your gums. Fruits and vegetables provide essential vitamins and nutrients that can help prevent and reduce inflammation. Protein helps your body repair itself. You should also be sure to drink plenty of water to stay hydrated. Proper cleaning of your dentures is just one part of the cleaning process. Brush your dentures with a soft bristled brush using water or denture paste. Avoid using toothpaste, as it contains abrasives that will scratch your dentures. Brushing helps to remove plaque, food particles and some of the bacteria. 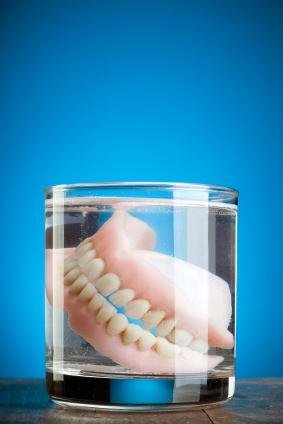 Soak your dentures in a denture solution. The solution breaks up stains and tougher plaque while killing any remaining bacteria. The second step of the cleaning process is cleaning your mouth. Even though you don't have teeth anymore, you can still suffer gum disease. Brush your gums with a soft bristled toothbrush. Make sure to brush your tongue and cheeks as well. Brushing your gums not only cleans them, but stimulates circulation, which allows blood flow to bring oxygen and nutrients to the tissue. Be sure to rinse your mouth with mouthwash to help kill bacteria and freshen your breath. Along with the above tips, make sure that you visit your dentist at least twice a year for regular exams. This is still important, even without teeth. Your dentist will be able to check your dentures for damage as well as check the health of your gums. However, things happen between visits. Contact our office if you have any concerns.